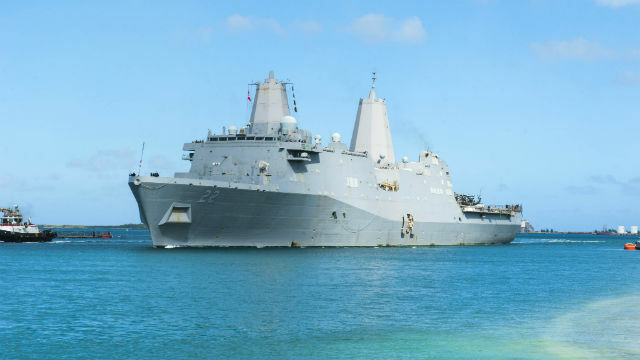 The amphibious transport dock ship USS San Diego has arrived in Puerto Vallarta for a regularly scheduled port visit. While in port this week, the crew of the San Diego will work with sailors from the Mexican Navy and also participate in a community relations project, helping to re-paint a local library. The crew will also have the opportunity to visit local attractions such as Old Town Vallarta, colorful markets and beautiful beaches, as well as experience the food and culture while taking some well-deserved rest and relaxation. “This visit provides the crew a great opportunity to see and experience new things while enjoying the nature of being in the U.S. Navy in a foreign port,” said Collins. The ship recently returned from seven-month deployment in the Indo-Pacific, Mediterranean, Horn of Africa and Middle East. The San Diego’s mission is to transport and deploy combat and support elements from Marine Expeditionary Units. The ship can carry more than 800 Marines and transport them to their objectives via air-cushion landing craft, amphibious vehicles and helicopters. It is currently the only Navy ship to be based in its namesake city.